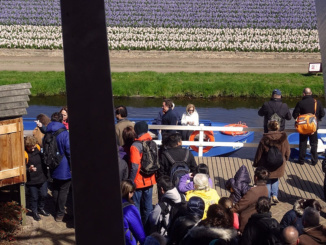 The tour of Keukenhof Flower Fields and Bulb Farm began at the Tours and Tickets Office at Damrak 26 in Amsterdam the Netherlands on Monday, April 17, 2017. 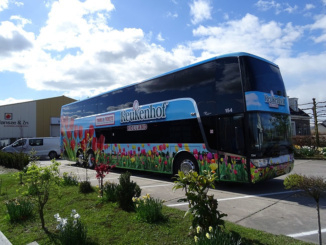 We had pre-purchased this excursion almost five months earlier via the Tours and Tickets website at 65 Euro each. 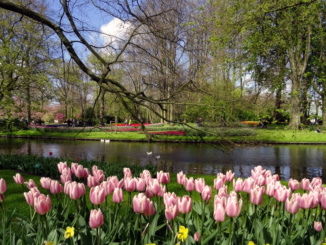 We chose this location as it was less than a five minute walk from the Park Plaza Victoria Hotel in Amsterdam where we were staying. Be careful when booking these tours as the Tours and Tickets Offices are located all throughout the city. 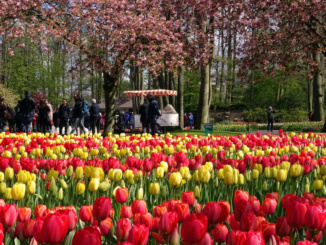 The Keukenhof Flower Fields and Bulb Farm tour began sharply at 9:40am. We left Damrak 26 and headed on foot to a double decker bus waiting about ten minutes away. We sat on the top right side of the bus. Our tour guide was Michael and our driver was Artinese who was originally from Greece. 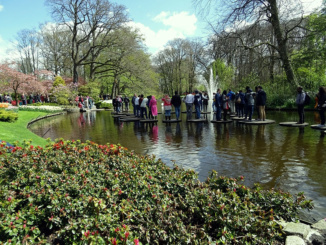 On the way to the Gardens, the tour guide provided many facts about the Netherlands. We passed through a tunnel that was 6 meters below sea level and learned that the entire country is basically below sea level. We passed a storehouse where unclaimed bicycles are taken into custody and stored. 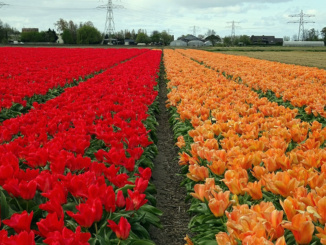 We learned that tulips were a prize possession long ago and in 1634 they were so rare, and not yet in the region, that 1 mere tulip cost the equivalent of 3,500 Euro. 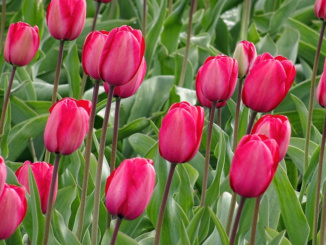 Rich ladies would wear a single tulip pinned to their dress as a show of wealth. 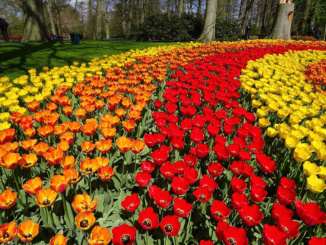 This marked the beginning of what would become known as Tulipomania. 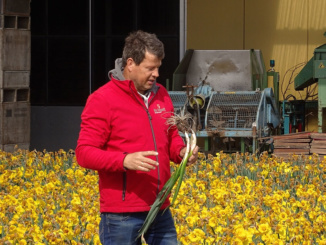 We first stopped at De Tulperij Bulb Farm where the owner walked us through the process from planting to harvesting. At the bulb farm they are only interested in the bulb and have no use for the flower at all. 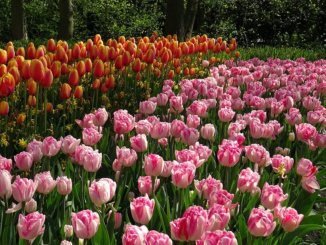 Tulip bulbs are planted in October and harvested in June of each year. 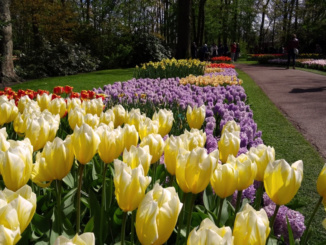 At the farm we saw daffodils which were just going out of season and tulips which were in full bloom. 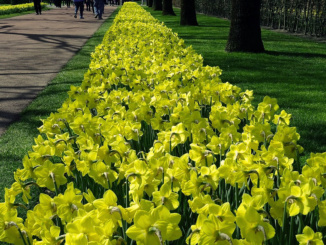 There was also a short video presentation about the bulb farming process. 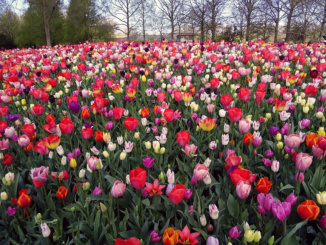 We walked to the fields and amongst the flowers for many photographs. Afterwards we perused the gift shop and had some hot tea and Danish pastries. 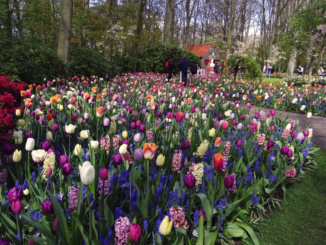 Our next stop was the Keukenhof Gardens. We arrived at 12 noon and took a short 5-minute walk to the entrance. What was quite nice was the Tours and Tickets buses have reserved, up front parking. On our return tour 11 days from now we are going to have to walk a lot further. 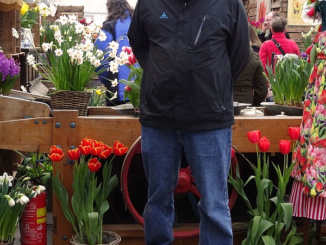 We entered the gates with the provided pre-bought tickets from the tour company and we were off to flower heaven. 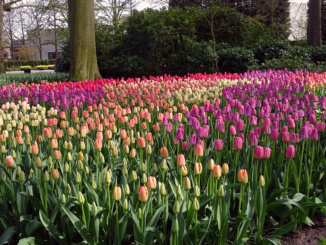 The tulips were up and not yet opened and looked absolutely gorgeous. 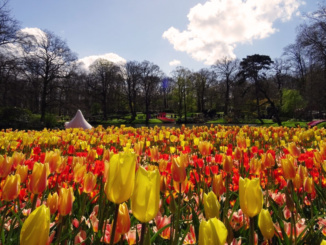 There were so many flowers (800 different types of tulips on display at Keukenhof) that it was hard to focus on what to look at next. 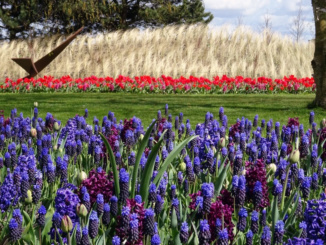 If you have never been to the gardens, I highly recommend it. 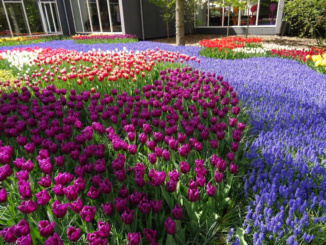 We entered the newly designed Main Entrance, relocated for 2017, and headed left for Tulipomania. 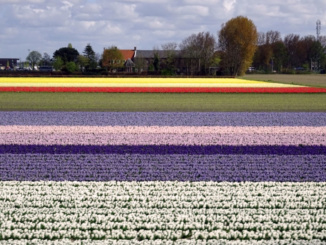 As you might guess the area was loaded with tulips displayed in very masterful ways. 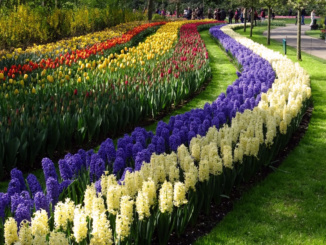 Next we proceeded on the outside loop of the gardens walking through daffodils, tulips, and hyacinths. At the lake we changed direction more towards the center of the gardens and walked among the stones on the lake. 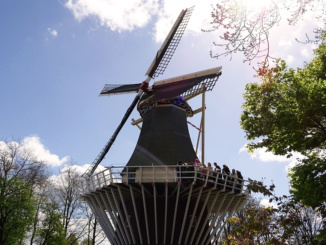 Afterwards we found the Dutch Windmill of 1892 and made our way to the platform overlooking the flower fields located on the side of the Garden. Our visit concluded with a wonderful Ham Sandwich found just outside the Dutch Windmill. It was thinly sliced ham that was then grilled and topped off with a dash of special Danish sauce. Yum! We made a note to have another on our subsequent visit. It was a wonderful day and eye-opening experience but with the limited on site time of 3 hours, it simply wasn’t enough time to relax and take it all in. We did not enter any of the numerous out buildings around the gardens, showcasing flower varieties and orchids, simply because there wasn’t enough time to enjoy them. We also knew that we would be returning in a mere 11 days so we saved the out buildings for our return visit. We met the bus back at the meeting point with departure promptly at 3:30pm. 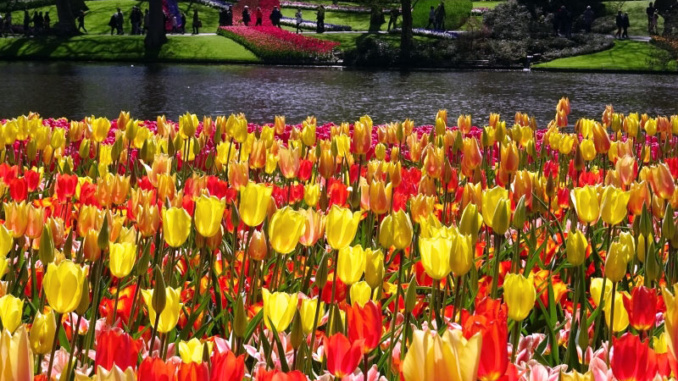 It was a 52-minute return trip to the city center of Amsterdam. 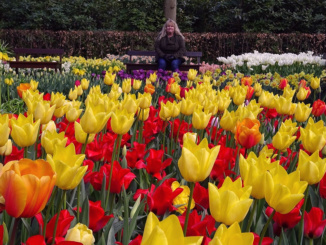 Once we returned to Amsterdam with the tour bus, we decided to take a side trip on our own. 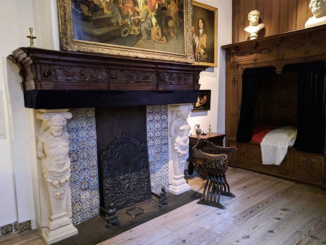 We headed to the 17th century home of Rembrandt that is open for viewing at the Rembrandt House Museum. We boarded Tram 9 and got off at the Waterlooplein stop. As soon as we got off we realized the area was quite sparsely populated and we had no idea which direction to go. (The correct answer is to continue walking down Waterlooplien in the same direction as the Tram is heading.) 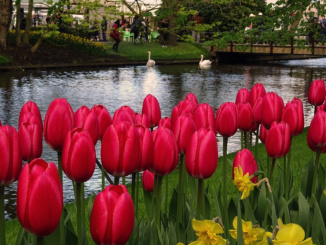 At this point you will pass the Waterloopleinmarkt (Floating Flower market) on the left then immediately join Mr Visserplein Street. From there, almost immediately on the left is a street called Jodenbreestraat Centrum. Take this street one block and cross over Nieuew Vilenburgerstraat. 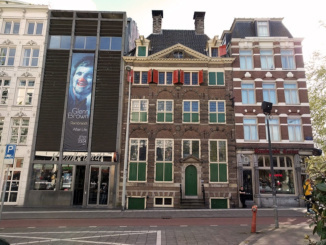 The Rembrandt House Museum will be on the left at the end of the block just before the canal. We arrived at the Rembrandt House Museum about 5pm and were immediately told that the museum closes at 6pm. One hour was almost enough time although a half hour more may have been perfect. The museum offered an audio guide in Dutch, English, German, French, Italian, Spanish, and Russian that was included in the entrance fee of 13 Euro per Adult. I thought the layout and audio portion a bit chaotic and not as well planned out as Our Lord in the Attic but still plenty effective for our education. The museum itself did not disappoint and we saw all the rooms of the house that were used in daily life by Rembrandt. We saw the common kitchen area and sleeping quarters on the lower levels. We learned that the beds of that era were short (about 40% less than today’s version) because it was thought that sleeping in a sitting position was healthier. 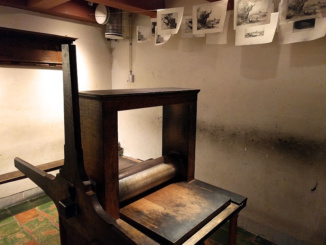 Another area we toured was called the Anteroom where he did etchings and ran a printing press. There was another room called the Large Studio where he painted many of his masterpieces between 1639 and 1656. On the top floors there was a studio where 4 or 5 apprentices studied under the tutelage of the master painter. 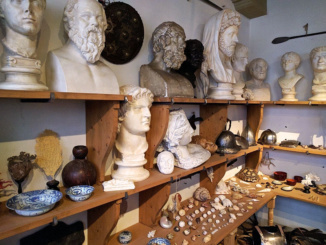 We also saw the numerous plaster casts and other objects that were used as examples for the master and his students. 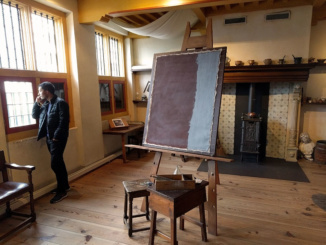 The home was unlike one would imagine a master painter such as Rembrandt would live in. Everything about the home seemed very simple but given the time period, this modest style was quite common. We did learn that much of the marble ascents in the home were actually just painted to look like real marble. 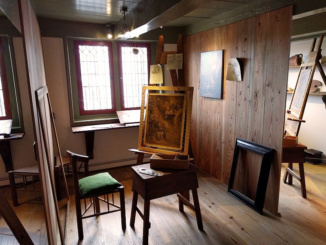 After the self-guided tour, there were several galleries displaying the paintings of other legendary artists aspiring to achieve Rembrandt’s status. We visited the gift shop for a few minutes and left promptly at 6pm.